Simplify pasture management with GrazonNext HL herbicide, a broad-spectrum weed control solution that’s convenient to use. GrazonNext HL provides season-long performance on over 60 species of broad-leaf weeds to help you get the job done effectively and efficiently. Because it is so complete, there’s no need to tank-mix with another product to pick up a specific tough weed. 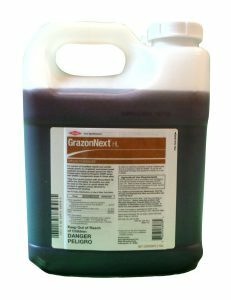 To add brush control, GrazonNext HL may be tank-mixed with PastureGard HL, Surmount or Remedy Ultra herbicide. Pick up GrazonNext and all your pasture care products at your local Farmers Coop location. We’ve got 17 locations to serve you in the NW Arkansas, River Valley, and Western Oklahoma. Have questions about your pasture, garden or lawns? Talk to our on-site Agronomist, in Ft. Smith. This entry was posted on Friday, August 25th, 2017 at 2:16 am	and is filed under News & Updates. You can follow any responses to this entry through the RSS 2.0 feed. Both comments and pings are currently closed.